Why Get A Custom Tailored Suit? 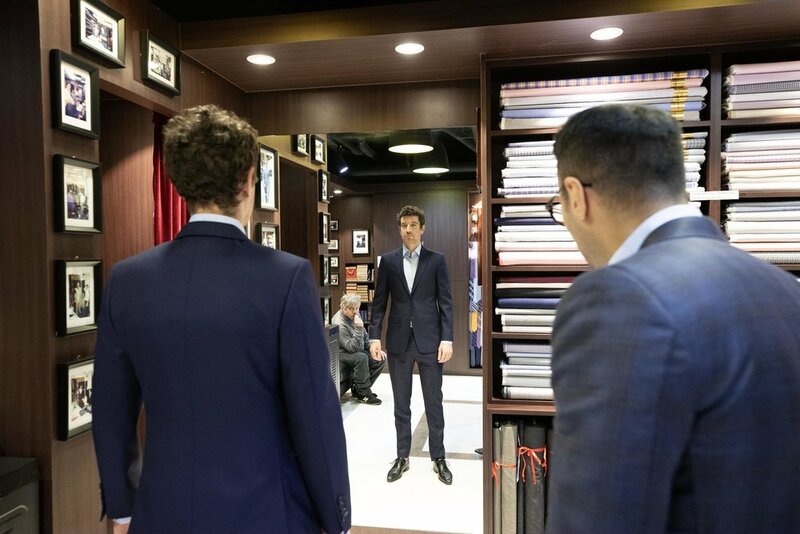 When I walked into Empire Tailors in Tsim Sha Tsui I had almost no idea about how a tailored suit is made, so the first consultation was a lot to take in. I was expecting to pick a colour, get measured, pop back in for a fitting and then pick up my new suit. This is not how it goes. Instead, I’m presented with books of what seem like thousands of different fabric swatches — not just different colours, but different weights and thread counts and patterns. There are herringbones, bird’s eyes, plaids, pinstripes and probably many more suit fabric design patterns. 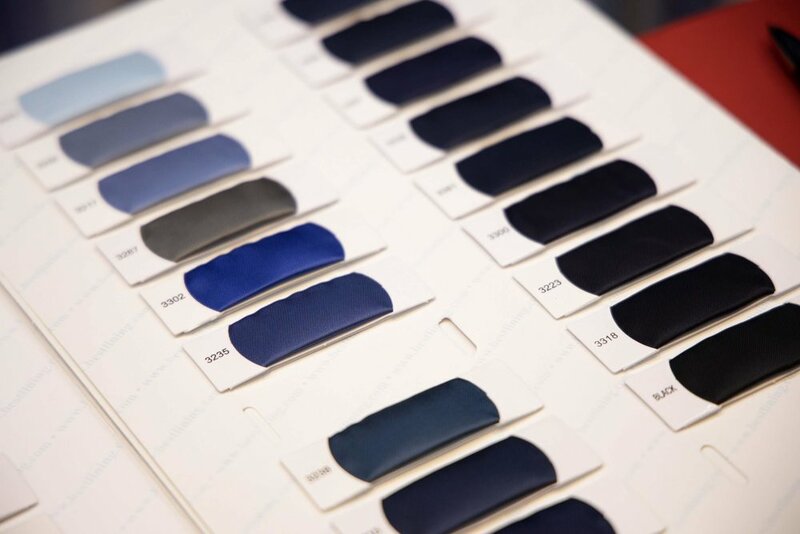 From light to heavy, and extremely fine to durable. Slightly bewildered, I opted for a plain navy cloth from Italian mill Comero Biella Italy with a medium thread count and year-round weight — an all-purpose fabric for daily wear and a safe choice. It turns out that was the easy bit. Next, we move on to the styling. With the help of Mark, I learn that nobody does three-button suits anymore so I agree that two buttons is the way to go. But what type of button? Plastic, horn? As it’s Veganuary and my suit already contains wool and horse hair (which is used for the internal structure of a suit), I opt for the non-animal button. But the horn buttons look nicer. Of course, one of the most important things about having a tailored suit is making sure other people know it’s a tailored suit, so I opt for pick-stitching on the lapels, which is done by hand and gives a nice bespoke look. Another tell-tale sign of the tailored suit, Mark tells me, is the winged lapel — often paired with slanted pockets to match. I’ve never come across this before and don’t know what to make of it, so decide to keep it subtle with a classic notch lapel and regular horizontal pockets. My other choices include a slim cut, minimum padding in the shoulders and jacket sleeves that actually button up at the cuff (rather than just looking like they do), with the last buttonhole highlighted in a lighter blue to add another custom touch. Then it’s back to another pile of swatches to pick a lining. At first, this seems like a low-consequence choice and I’m ready to pick out the first one I see without much thought, but Mark says the lining is a nice way to reflect your personality and I’m suddenly under pressure to find something meaningful. After a lot of flicking back and forth, I end up picking out a cool skull print that complements the blue highlighting on my buttonhole. By the end of the process, it’s actually one of my favourite touches and well worth the agonising. With all those choices in the bag, I get measured up and make an appointment to come back in a few days for a first fitting. It’s normal to have two or three, but it really comes down to how much time you can spare. As I live in Hong Kong, I had the luxury of getting the fit just right. 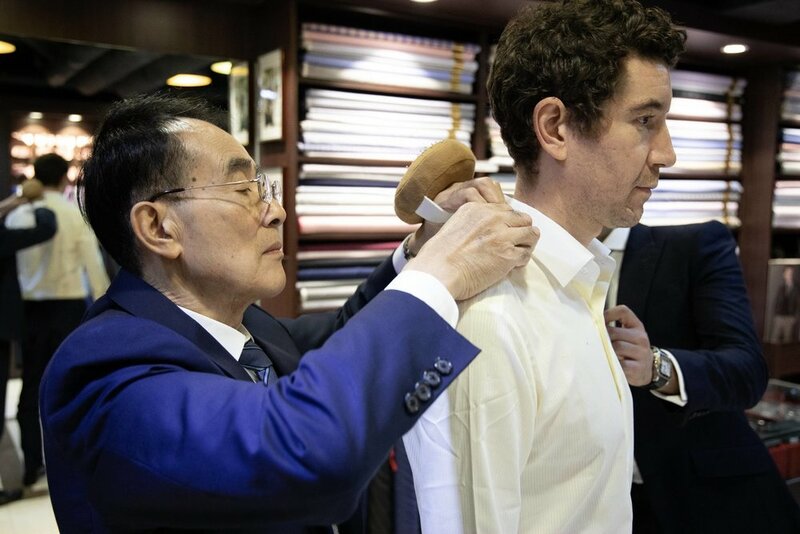 The first fitting is the hallmark of the bespoke suit tailoring experience, when you wear a quarter finished suit held together with temporary white basting thread and a tailor eyes you up and down and sticks pins in various places. At this point the entire custom suit is cut to a looser shape and the goal is to bring it in through the suit fitting process. It’s much easier to visualize what you want in terms of the fit at this stage. At first it’s just the custom trousers and shirt, showing the tailor where on your waist you wear your trousers, which affects how high the crotch should be, and how much of a crease you want in the trouser leg as it falls on to your shoe — known as the break. The custom shirt isn’t even made at this point. Shirts have less room for alteration so the first fitting is just mocked up with scrap fabric. Then it’s on with the jacket, checking to see how it sits, making adjustments to avoid any bunching of fabric and slimming up the mid-section to ensure that classic hour-glass silhouette of a tailored suit, which is something you can never really get off the peg. By the second suit fitting, the custom shirt is done and the suit just needs a few small adjustments to dial in the fit just how I wanted it, before I return for one last fitting to make sure everything is perfect. And then I walk away with my first tailored suit, complete with my name hand-embroidered on the inside.